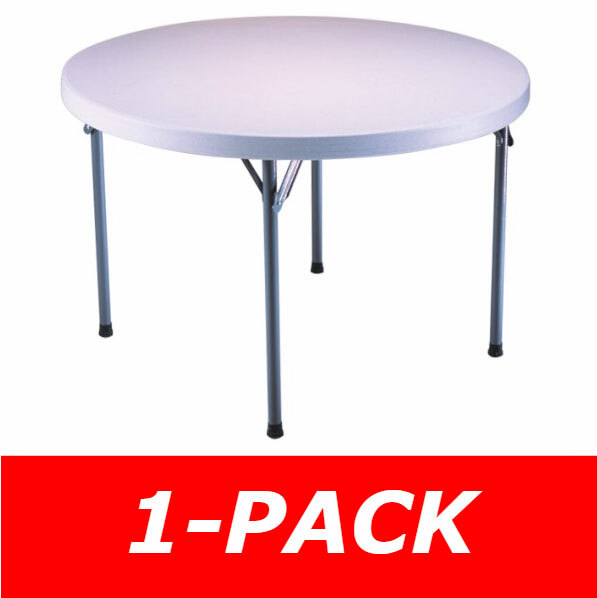 If you need more than one folding lifetime round table consider our Lifetime 2960 Lifetime 48 round tables folding frame 12 pack of Lifetime Folding Tables / Round Banquet Tables which offer free shipping. 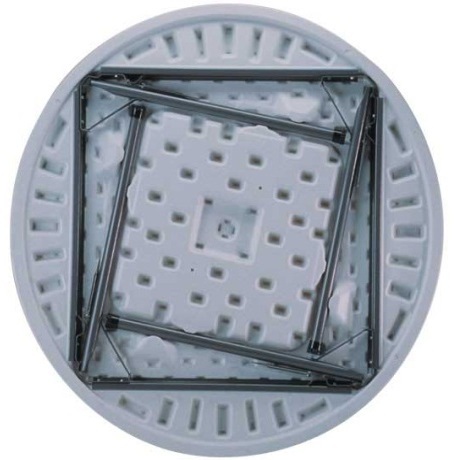 The diameter 48 folding round table is also lightweight and easy to clean. The 22960 Round Plastic Folding Table and our other Lifetime Round Tables are manufactured by Lifetime Products. View our other 46" round tables, lifetime outdoor tables and folding lifetime round table products. 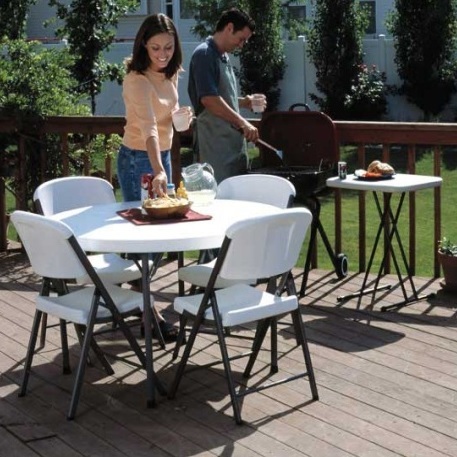 These Lifetime Indoor Outdoor Round Folding Tables generally ship through FedEx Ground in quantities of 1, but larger quantities of the Lightweight Round Tables are generally shipped through an LTL freight carrier such as Roadway or ABF to a curbside delivery. This table comes with a 10-year factory warranty from Lifetime Products. 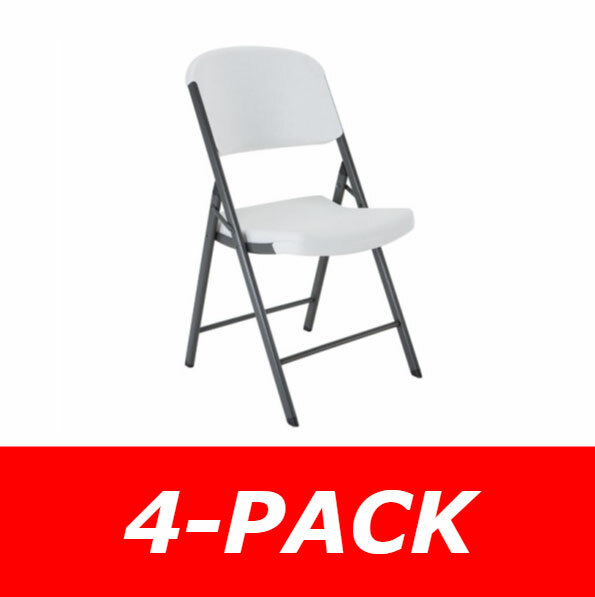 Purchase Round Folding Card Tables And Chairs from Competitive Edge Products, Inc. to save on shipping. Lifetime Diameter 46 inch Round Table Top Offers Superior Strength and Durability. 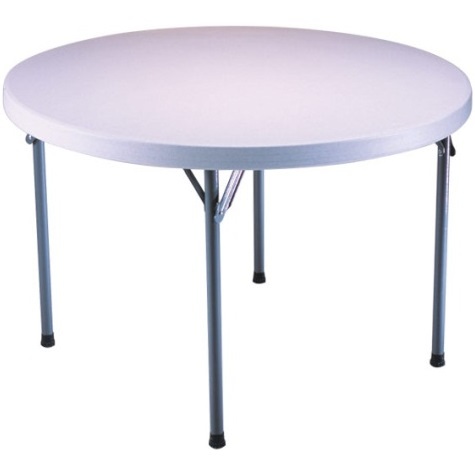 46 Inch Round Folding Tables are Lightweight. 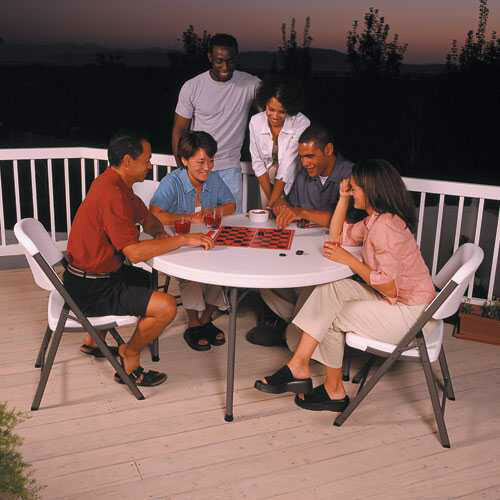 Round Folding Card Table works as Indoor/Outdoor Furniture. Round Lifetime Folding Table Serves as a great 46 inch round card table. 46 In Round Tables / Lifetime Tables are Stain Resistant and Easy to Clean. 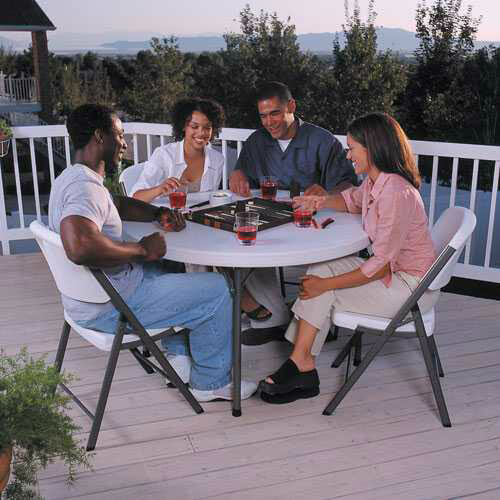 Banquet / Card Round Table is Ideal for Home, Banquet, Office, Crafts, Outdoor Activities and More! Plastic Round Tables Have 10-Year Limited Warranty. 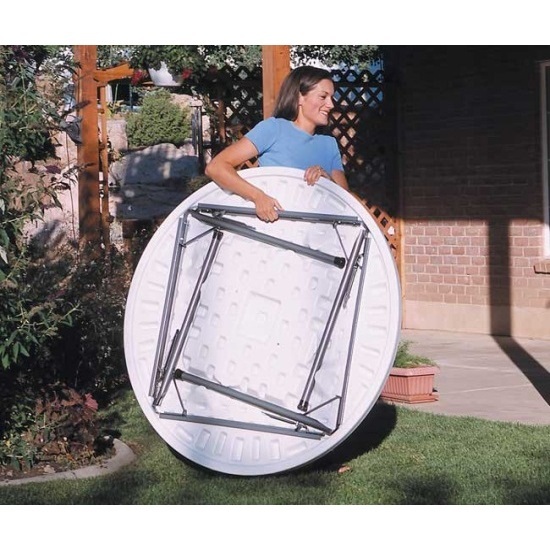 Folding 46 inch Round Folding Tables are Great as Camping Portable Tables. Includes a 10-year factory warranty. Table top weight capacity: 591 lbs. Folded dimensions: 46 inches x 2.25 inches. The table is great. It is everything I had hoped for and more. It was extremely difficult to find a table like this one. My experience with Lifetime products has been a positive one and my new table only adds to that positive experience. Love the 48" table ... light weight. Will fit in the back of my car ... looked everywhere for this size and could only find the 60 inch. I bought 4 of them! This table is very durable and easy to set up and take down. I use this table all of the time. We considered purchasing the fold up version but it was not as sturdy. This table is large enough for dining, group games and crafts without being too big and bulky. It requires more space to store but worth the quality and durability. Great table, perfect size not too big and not too small. Using as a table for my kids to do homework on in our new homework Command Center :) They love it, perfect for their projects and assignments. Easy to take up and put down. Q: Who covers the warranty for this round folding table? Q: What use does a 46 inch Lifetime Round Table provide? A: The 22960 Lifetime Round Table is best used as a banquet table or a display table. As a banquet table, it can usually seat about 6 adults around the table. As a display table, the table is very lightweight, small, and portable so it can easily be set up and taken down for your fair, convention, or get together. This round folding table ships from the warehouse in Clearfield, Utah. When ordering 2 or fewer, these tables will ship via FedEx for a doorstep delivery. No signature required for most residential addresses. When ordering 3 or more tables, the order will likely ship via an ltl freight carrier for a curbside delivery. This type of delivery requires the customer to be present to sign for the shipment and to move the tables wherever needed on the delivery property. The driver will not assist with moving the tables. Delivery appointments are scheduled through the freight company before delivery is attempted. The customer can wait for the freight company to contact them to schedule the appointment; or, the customer can contact the freight company to schedule the appointment once the customer has the tracking information for the shipment.